Ms. Stengel was planning retirement options when she first visited the Grayson SBDC in February 2005. “Ms. Stidham (SBDC Director) encouraged me to pursue something I knew well. I had been an educator for 21 years and love teaching. It just seemed logical…that this was what I should pursue,” stated Ms. Stengel. Counseling regarding start up requirements, financing and marketing as well as the use of SBDC library resources were provided by the SBDC. 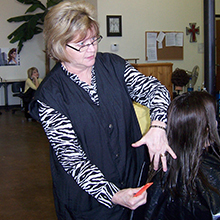 Soon after visiting the SBDC a loan was secured and Diamond Cosmetology College opened for business July 13, 2005 in a rented building. The first six months was touch and go. Counselor, Ken Mullins, suggested using new student recruitment methods which proved very successful. Initially, Ms. Stengel taught all classes 8 am-9 pm six days a week. Today, Ms. Stengel has 7 seven employees and shares the teaching duties with additional full time instructors. Customer services sales increased from $500.00 weekly initially to over $2,500.00 weekly currently. Student enrollment has also grown dramatically. Enrollment is currently at 55 students and is near capacity, even in the new larger building. Accreditation with the Council on Occupational Education was earned as was Department of Education accreditation which makes student financial aid available and thus is a very important milestone. Ms. Stengel is always interested in improving her business and participated in two recent opportunities through the Jobs Act program at the Grayson SBDC. The first activity was an energy audit. A cosmetology training facility requires a substantial amount of electrical energy as well as water resources and the audit was a means of identifying ways to reduce the operating cost by reducing or eliminating energy use. A few months later, the client requested an on-site visit by Marc Willson, a retail and marketing specialist. Mr. Willson suggested activities and techniques the client can employ to increase marketing and enrollment.